The other day, I had to make a run to Publix to pick up a few things for our office kitchen—paper plates, half-and-half, Splenda, etc.—and while I was there, I decided to pick up something for lunch. Publix has these wonderful Sushi Avocado Salad Rolls that I adore, but at 19 net grams of carbs (for both, no sauce), and because they aren’t quite filling enough to constitute a whole meal, I wanted something hot to go with them so I would feel satisfied. So after picking up everything else I needed, I found myself in the frozen food section. Publix has a lot of unique brands and ethnic foods that the main place I shop, Kroger, doesn’t. So I really was just browsing to see what unique things were there. I usually don’t bother with frozen meals because they’re almost always filled with carbs—in either rice or noodle form—and I wasn’t really feeling up to another frozen Atkins meal. Yep, you’re reading that correct—a frozen entree that isn’t marketed as “low carb” with only 6 net grams of carbs for the entire thing. Now, I will say that once heated, the spinach didn’t look quite as . . . appetizing as the image on the front of the container. (As one of my coworkers said, it somewhat resembled something one might find in a diaper.) But it tasted really good. Lightly spicy (to my tastebuds, anyway) and very flavorful. Yes, it does contain chickpea flour, potato starch, dextrose/dextrin, and sugar. One of the things that amazed me, though, is that I actually know what everything in this ingredients list is and I can pronounce all of them. The only problem I had with it was that last ingredient on the list: Mango Powder. You see, I’m allergic to all tropical fruits, including mango. They make my throat swell shut. 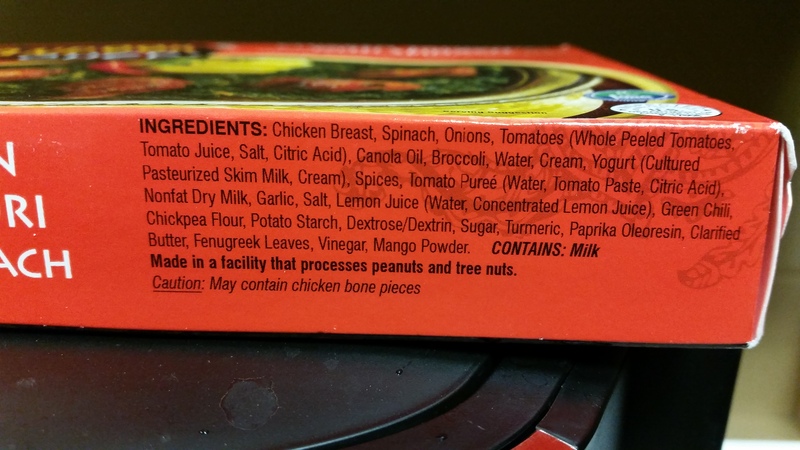 I’ve never heard of mango “powder” though, and I’ve never thought to look for something like that in the list of ingredients of prepared foods. There wasn’t much of it in there, because the only symptom I had was pain in the roof of my mouth (like when you just can’t stand it and bite into pizza right after it comes out of the oven and it scorches you) and tingling in my tongue for a few hours. But now that I know, I can just take an antihistamine with it next time I get it. It’s just that good! 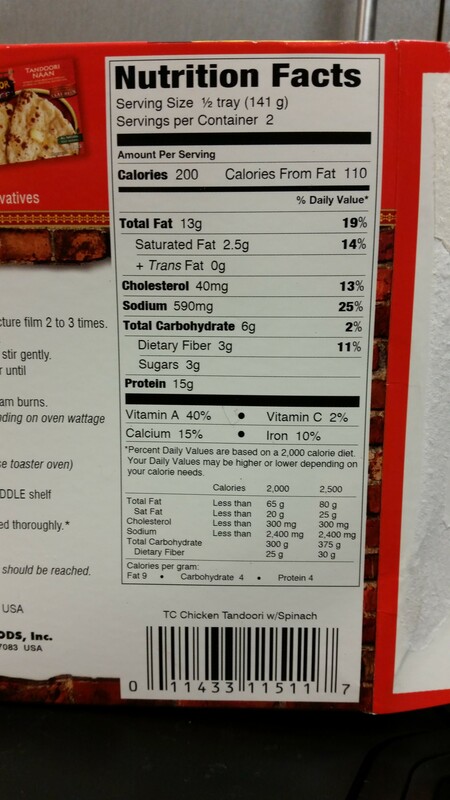 This entry was posted in Grocery Store Finds, Low-Carb. Bookmark the permalink.